The holy grail of rare and collectable Whisky and a far superior piece compared to many of the $100,000+ man made Whisky collectables on the market. 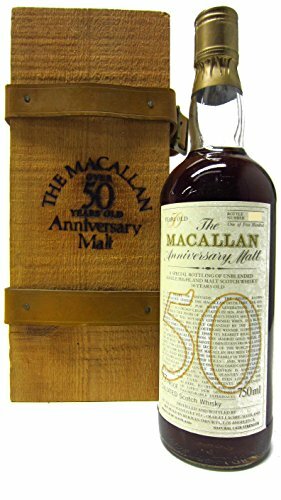 Produced from three casks dated between 1926 and 1928 this Macallan was bottled in 1983 and although it is labeled as a 50 year old it is in fact, if you do the maths, a 55 year old. Supplied in its original leather strapped wooden crate and complete with a personal letter of authenticity from the then chairman of Macallan Allan G. Shiach. This example, which was one of only 500 worldwide, is in perfect as new condition and would be the centerpiece of any Macallan collection and the envy of all your friends and probably the Presidents of many countries.